Android - the most popular platform for mobile applications. With ZennoDroid you can automate them. Commits an act with the mouse on the screen of mobile applications in the same way as if you did it on your phone with your fingers! 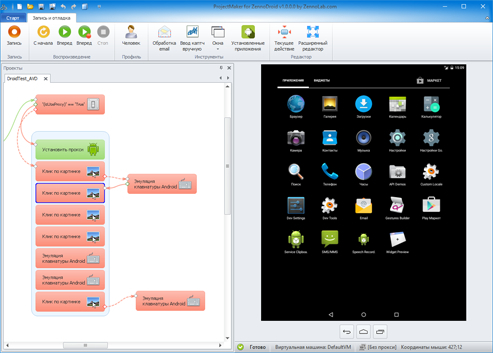 Many functions, such as working with files, text, tables, logic, network, and many others have come with ZennoDroid. Is it possible to put the program on a virtual machine? Probably not, because program on the system resources. The program has some kind of subscription fee or something like that? Yes, the program is purchased for exactly one year. By extension requires the maturity. Can I buy the program cheaper during the action, and then re-sell when a stock is going to end? No resale of the program is strictly prohibited and may result in banning your account.